George Graham Reviews Billy Jonas' "Life So Far"
In a music world crowded with thousands of performers in almost any given genre, originality is obviously the way to make one's mark. In the commercial music world, that usually means a that any creative energy is put into a marketing plan or fashion statement, rather than into music that might be in some way innovative. But in jazz, folk, and other less commercial styles, actual musical originality does have a place in setting a performer apart in the field. This week, we have a new CD by a folk-influenced artist who really is a genuine original: Billy Jonas, whose new CD is called Life So Far. Jonas, who tells his life story in a 15-minute-long track on his album, grew up in a family who encouraged his music, and his tendency to bang things together as a child. That eventually led to his making music out of found objects, or making unconventional percussion instruments. By the time he was in college he was doing that before audiences and apparently developing a significant number of fans. Jonas became part of a folk duo called The Billys, but went solo again a few years ago. His performances with his contrived percussion instruments that encourage audience involvement, have been attracting the attention of others in the folk world, mainly because in addition to his unconventional instrumentation, he has also become a highly original and downright clever songwriter and a worthy guitar player as well, likely to break into something reminiscent of the late innovator Michael Hedges. The North Carolina-based Jonas also puts on shows for children and families, in addition to his performances on the folk circuit. Apparently some of his fans and musical colleagues wondered how his involving live act would translate onto CD, but the result is a brilliant record that combines Jonas' adroit writing, often laced with wit, fine guitar work, rapid-file vocal delivery, and eclectic instrumentation. Not having seen Jonas in concert, I can't say how Life So Far stacks up to his live shows, but as a CD, it possesses a rare energy level and plenty of downright interesting music, with both the lyrical content and musical arrangements demonstrating considerable creativity, all without sounding in any way gimmicky. Jonas' percussion instruments may not as prominent as they probably are in some of his live shows, instead, CD focusses is on his songs which really are quite ingenious lyrically, often drawing interesting observations from life, and frequently engaging in wordplay. He is joined on the CD by a large group of musicians, including world-music percussionist Glen Velez, Eliot Wadopian on acoustic bass and Stephanie Winters on cello, plus a raft of backing singers, including fellow North Carolina singer-songwriters Chris Rosser and Beth Wood. Making a cameo appearance is Dr. Robert Moog, inventor of the synthesizer that bears his name, playing some of his newer electronic devices and a recreation of an old fashioned theremin. 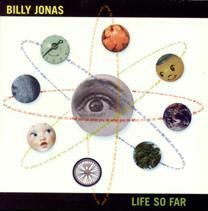 On Life So Far, Billy Jonas has created a very original and engaging album that combines aspects of his distinctive live performances, with his improvised or unconventional percussion instruments, with excellent songwriting marked by astute, frequently witty wordcraft. The combination of the often infectious percussion beats and grooves, the large group of supporting vocalists who sound as if they are having a lot of fun, and the often downright fascinating arrangements add up to a most impressive album that really does stand apart in a crowded singer-songwriter field. And Jonas can also deliver a message in the context of the fun. From a sonic standpoint, we'll give Life So far, about an A-minus. Some of the percussion is quite impressive, and a number of the studio tricks are well-done and highly effective, but often the sound of the percussion can be a little bass-heavy and some of the more laid-back tracks dominated by the acoustic guitar are compressed too much. But overall, it makes good listening an a decent stereo system. While others in the pop music world have tried to distinguish themselves with fashion or gimmicks, Billy Jonas uses genuine originality and a style that evolved naturally from his experience, to create memorable music that is both intellectually fascinating and frequently danceable, all the while avoiding the cliches. There are albums I call "ear grabbers" for their ability to engage and demand people's attention by their sound that stands well-apart from the norm. Billy Jonas' Life So Far is definitely one of those.